Rembrandt – the greatest master of the golden age of Dutch painting, which above all put a person and his experiences. Even in portraits, he paid a lot of attention to the inner world of the hero, revealing it in small, imperceptible lines. In the same plot scenes revealed fully. Creative in the style of classicism. The “holy family” of his hand differs from the other works of the same subject in that it represents a household moment, which does not give up holiness or torment. In the cramped room, in a straw cradle, covered with a blanket, Christ sleeps. His face is serene, he dreams of something good. The mother bends over him, looking up from the reading, covers the cradle from the bright light that worries the baby, at the same time making sure that everything is alright with him, that he is not bothered by nightmares, that he does not have a stomachache, that he is not breathing too superficial a dream. In the background, under the wall hung with tools, Joseph is a carpenter. With an ax, he flattens some blank, bending low towards it. His beard is slightly gray from gray hair. 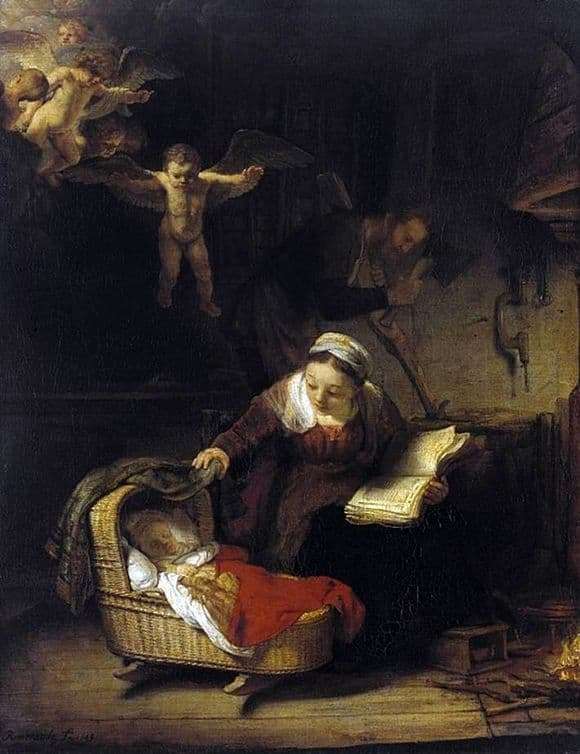 The colors of the paintings are muffled, because there is a dusk in the room, which is accelerated by the light of the hearth, and only the divine light of the little soaring angels – small, plump and curious – reminds that this is not just a family, and not just an ordinary life scene. What is sleeping in the cradle is not just a baby, some hundreds in the world, but God incarnated into a human body. That his mother conceived him of the Holy Spirit, without the touch of a mortal man, and that Joseph is the earthly father of Christ, and not just a carpenter working in his house in the evening. The whole picture is imbued with an atmosphere of peace and quiet. The cross is still far away, and the terrible Golgotha ​​still does not wash Pilate’s hands and does not shout “Let us go, Barabbas!” In the crowd. Before that, even years and years. In the meantime – the mother cradles the child and at this particular moment there is nothing more important.